The Hovey Book: The English Ancestry and American Descendants of Daniel Hovey of Ipswich, Massachusetts, , at https://books.google.com/books?id=-VVVAAAAMAAJ . Haverhill, Mass. : Press of Lewis R. Hovey, (1914) , p. 199-202, 107. Newton (Mass. ), Vital records of Newton, Massachusetts, to the year 1850, Boston: New England historic genealogical society, at the charge of the Eddy town-record fund, (1905) , p. 103. The Hovey Book: The English Ancestry and American Descendants of Daniel Hovey of Ipswich, Massachusetts, , at https://books.google.com/books?id=-VVVAAAAMAAJ . Haverhill, Mass. : Press of Lewis R. Hovey, (1914) , pp. 259-60. Obituary of Harriet Maria (Rogers) Howard. Samuel Atkins Eliot, A History of Cambridge, Massachusetts, 1630-1913, Cambridge, Mass. : The Cambridge Tribune, (1913) , p. 216. Record added: Nov 13, 2013. Town and City Clerks of Massachusetts, Massachusetts Vital and Town Records, Provo, UT: Holbrook Research Institute (Jay and Delene Holbrook),. Ancestry.com. Massachusetts, State Census, 1855 [database on-line]. Provo, UT, USA: Ancestry.com Operations, Inc., 2014. Massachusetts Deaths, 1841-1915, at https://familysearch.org, p. 59 1641, Film Number: 960206, Digital Folder Number: 4221421, Image Number: 62. Thomas W. Baldwin, Vital Records of Cambridge, Massachusetts, to the year 1850, Boston: Wright & Potter Print. Co., (1914) , p. 800. Ann married Joshua Gardner on May 19, 1828 in Dorchester, Massachusetts. living at Ward 16, Boston, Massachusetts. Town and City Clerks of Massachusetts, Massachusetts Vital and Town Records, Provo, UT: Holbrook Research Institute (Jay and Delene Holbrook), , Dorchester > Dorchester Intentions of Marriages, 1850-1969 > 37. Vital Records of Dorchester from 1826 to 1849, Volume: 54, Boston, MA: Boston Registry Department, (1905) , p. 30. Annie Howard was born perhaps about 1841. Seth C. Cary, John Cary, the Plymouth Pilgrim (n.p. : Seth C. Cary, Dorchester Center, Boston, MA, 1911, unknown publish date), p. 92. Vital Records of Brockton Massachusetts to the year 1850, , at https://archive.org/details/vitalrecordsofbr00broc . Boston, Mass. 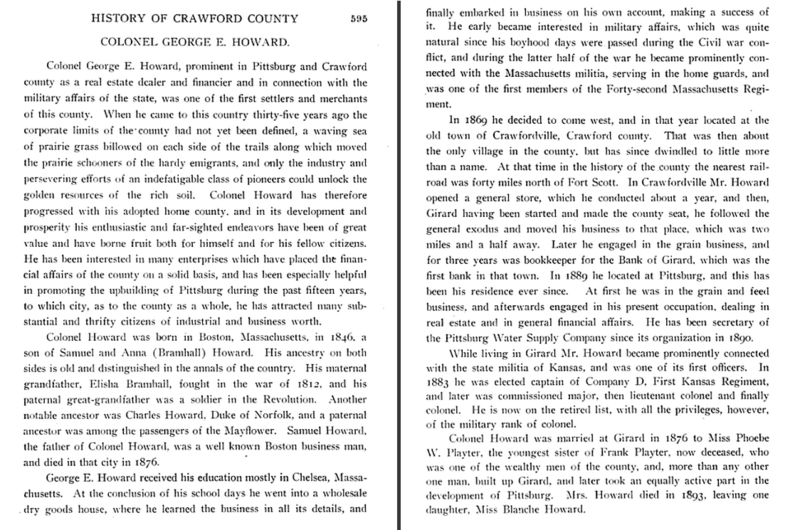 : New England Genealogical Historic Society at the charge of the Eddy Town-Record Fund, (1911) , p. 335. 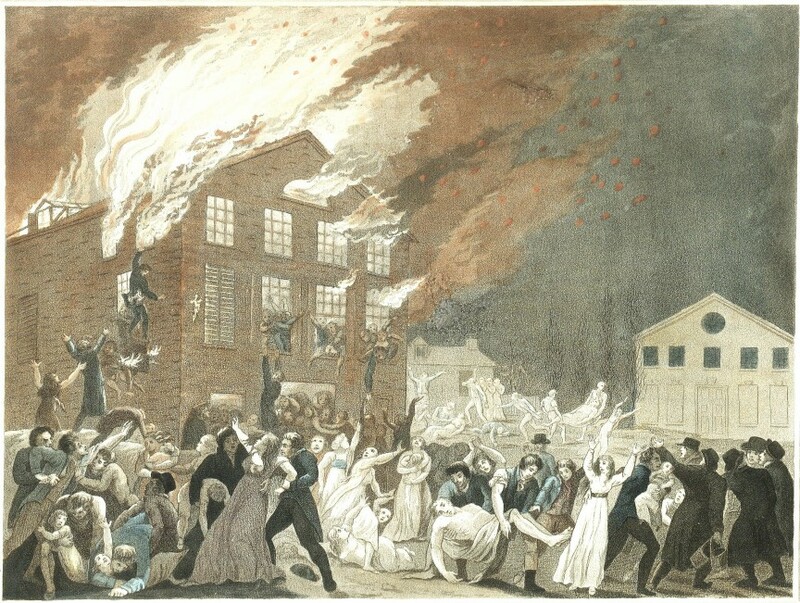 "Massachusetts Births and Christenings, 1639-1915," database, FamilySearch (https://familysearch.org/ark:/61903/1:1:V5NH-14X : 4 December 2014), Sibbil Howard, 26 Jun 1784; citing BRIDGEWATER,PLYMOUTH,MASSACHUSETTS, ; FHL microfilm 164,691, 164,692. Bethiah Howard was born perhaps about 1754. Bradford Kingman, History of North Bridgewater, Plymouth County, Massachusetts, from its first settlement to the present time, , at https://books.google.com/books?id=B-tHAQAAMAAJ . Boston: Published by the author, (1866) , p. 517. Representative men and old families of southeastern Massachusetts, Vol. 3, , at https://books.google.com/books?id=GHIWAAAAYAAJ . Chicago: J. H. Beers & Co., (1912) , pp. 1532-3.
living at Pettis Township, Platte County, Missouri. 1880 United States. Census Office. 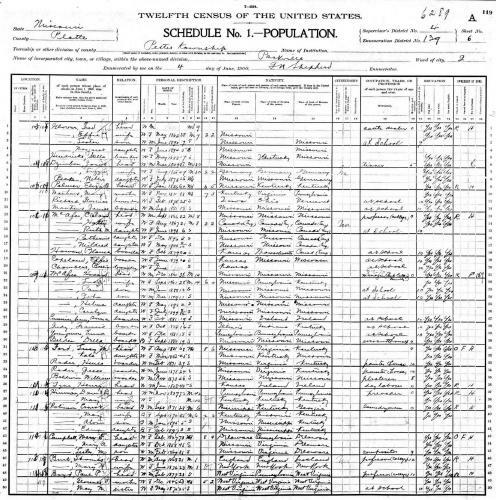 10th census, 1880 federal population census, Washington, District of Columbia: National Archives and Records Service, ([19--]) , Census Place: Girard, Crawford, Kansas; Roll: 378; Family History Film: 1254378; Page: 49C; Enumeration District: 055; Image: 0206. 1900 United States. Census Office. 12th census, 1900 population census schedules, Washington, District of Columbia: Bureau of the Census Micro-Film Laboratory, ([197-]) , Census Place: Pettis, Platte, Missouri; Roll: 882; Page: 6A; Enumeration District: 0139; FHL microfilm: 1240882. 1895 Kansas State Census, Kansas State Historical Society, , Line: 1, Roll: v115_35. 1905 Kansas State Census, Kansas State Historical Society, , Line: 23, Roll: ks1905_36. Warren Robert Cochrane, History of Francestown, N. H.: From Its Earliest Settlement April, 1758, to January 1, 1891, Nashua, N. H.: James H. Barker, Printer, (1895) , p. 770. 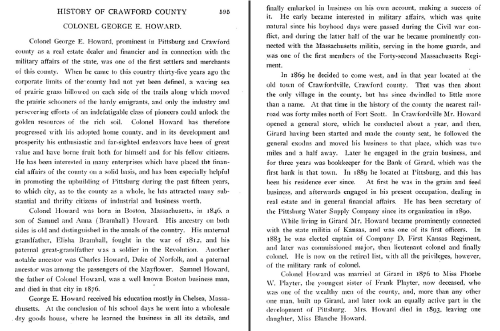 "Massachusetts, Deaths, 1841-1915," index and images, FamilySearch (https://familysearch.org/pal:/MM9.1.1/N7BF-RQK : accessed 11 May 2014), John D. Howard in entry for Charles Howard, 06 Apr 1893; citing Chelsea, Massachusetts, v 438 p 538, State Archives, Boston; FHL microfilm 961511. 1880 United States. Census Office. 10th census, 1880 federal population census, Washington, District of Columbia: National Archives and Records Service, ([19--]) , FHL Film 1254562; National Archives Film T9-0562; Page 390B. Vital Records of Bolton, Massachusetts, to the end of the year 1849, Worchester, MA: Franklin P. Rice, (1910) , p. 47. "United States Census, 1900," database with images, FamilySearch (https://familysearch.org/ark:/61903/1:1:M9YY-76Y : 6 March 2015), Osca F French, Precinct 1 Chelsea city Ward 2, Suffolk, Massachusetts, United States; citing sheet 4A, family 73, NARA microfilm publication T623 (Washington, D.C.: National Archives and Records Administration, n.d.); FHL microfilm 1,240,689. "Massachusetts, Marriages, 1695-1910," index, FamilySearch (https://familysearch.org/pal:/MM9.1.1/FH8Y-ND9 : accessed 06 Nov 2012), Oscar F. French and Ellen M. Howard, 18 Jun 1865; citing reference , FHL microfilm 818082. "United States Census, 1880," database with images, FamilySearch (https://familysearch.org/ark:/61903/1:1:MHX1-JQP : 24 December 2015), Josephine E French in household of Oscar F French, Chelsea, Suffolk, Massachusetts, United States; citing enumeration district ED 789, sheet 314C, NARA microfilm publication T9 (Washington D.C.: National Archives and Records Administration, n.d.), roll 0562; FHL microfilm 1,254,562. Emma Howard was born perhaps about 1843. "Massachusetts, Deaths, 1841-1915," index and images, FamilySearch (https://familysearch.org/pal:/MM9.1.1/N75P-24K : accessed 06 Nov 2012), Frederick L. Legg, 1872. Massachusetts Vital Records, 1841-1910, , Boston > Marriages, 1800-1849, Vol. 2 > 293. "Massachusetts, State Census, 1855," index and images, FamilySearch (https://familysearch.org/pal:/MM9.1.1/MQ4Z-KDZ : accessed 25 Nov 2012), Emma A Legg in household of William L Legg, Auburn, Worcester, Massachusetts. "Massachusetts, State Census, 1865," index and images, FamilySearch (https://familysearch.org/pal:/MM9.1.1/MQH5-T21 : accessed 06 Nov 2012), Emma A Legg in household of William L Legg, Auburn, Worcester, Massachusetts. "Massachusetts, Births, 1841-1915," index and images, FamilySearch (https://familysearch.org/pal:/MM9.1.1/FXCB-97W : accessed 06 Nov 2012), Gertrude Ann Hall Legg, 1855. He was the son of Samuel Howard and Anna Eliza Brimhall. Howard, Geo E, clerk, 24 Otis. boards 288 Dudley. Howard & Co. G E Howard & J W Tolman, owners. dry and fancy goods. 81 Milk. living at 104 Summit Avenue, Girard, Crawford County, Kansas. Home Authors, A Twentieth century history and biographical record of Crawford County, Kansas, Publishing Company, (1905) : Transcribed by Carolyn Ward in November 2003. Online at http://skyways.lib.ks.us/genweb/archives/crawford/history/1905/howard_george_e.html , p. 595-596. Home Authors, A Twentieth century history and biographical record of Crawford County, Kansas, Publishing Company, (1905) : Transcribed by Carolyn Ward in November 2003. Online at http://skyways.lib.ks.us/genweb/archives/crawford/history/1905/howard_george_e.html. 1900 United States. Census Office. 12th census, 1900 population census schedules, Washington, District of Columbia: Bureau of the Census Micro-Film Laboratory, ([197-]) , Census Place: Pittsburg Ward 4, Crawford, Kansas; Roll: T623 477; Page: 5B. Massachusetts State Census, 1865, Boston, Massachusetts: Massachusetts State Archives, , Family Number: 652, Line Number: 28, Film Number: 0954575, Digital Folder Number: 4287715, Image Number: 00062. Combined Kansas Reports, Kansas State Printing Plant, (1888) , p. 53.
living at Ward 9, Boston, Massachusetts. "Massachusetts Deaths, 1841-1915," database with images, FamilySearch (https://familysearch.org/ark:/61903/1:1:NWTJ-2YT : accessed 13 December 2015), Henrietta Howard in entry for Mary W Nazro, 02 Aug 1908; citing Boston,,Massachusetts, 435, State Archives, Boston; FHL microfilm 2,217,884. Vital Records of the Town of Dorchester from 1826 to 1849, Boston: Rockwell and Churchill, City Printers, (1905) , p. 168. Town and City Clerks of Massachusetts, Massachusetts Vital and Town Records, Provo, UT: Holbrook Research Institute (Jay and Delene Holbrook), , Boston > Deaths, 1864 > 30.
living at 16 Cherry St., Chelsea, Massachusetts. "Massachusetts Births and Christenings, 1639-1915," database, FamilySearch (https://familysearch.org/ark:/61903/1:1:FZ8L-XZQ : 4 December 2014), John Day Howard, 23 Jan 1815; citing CHELSEA,SUFFOLK,MASSACHUSETTS, ; FHL microfilm 0874029 IT 1. Town and City Clerks of Massachusetts, Massachusetts Vital and Town Records, Provo, UT: Holbrook Research Institute (Jay and Delene Holbrook), , Boston > Marriages, 1800-1849 > 55. 1880 United States. Census Office. 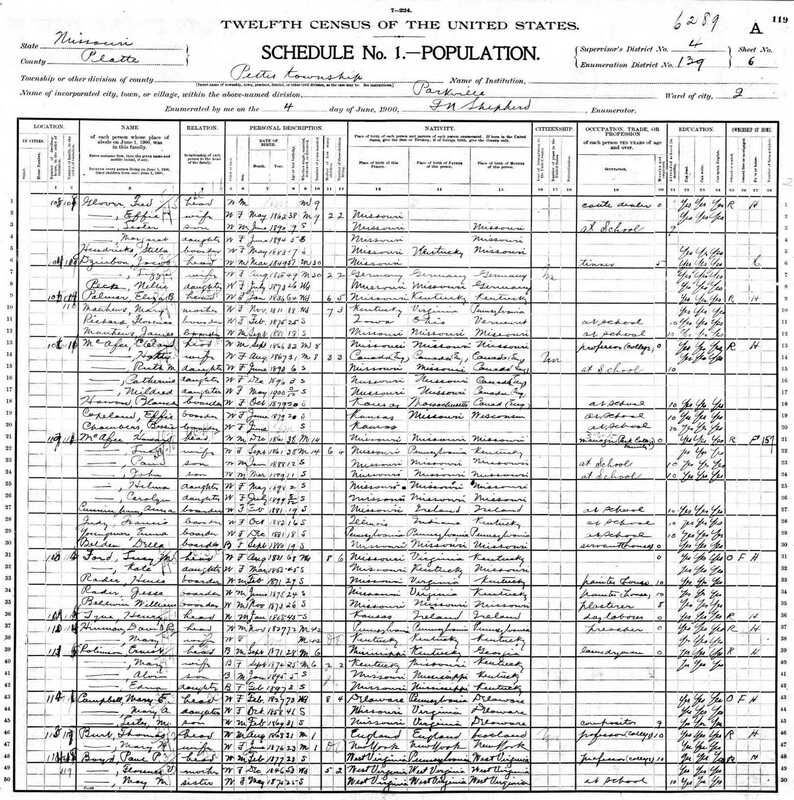 10th census, 1880 federal population census, Washington, District of Columbia: National Archives and Records Service, ([19--]) , Census Place: Chelsea, Suffolk, Massachusetts; Roll: 562; Family History Film: 1254562; Page: 315B; Enumeration District: 789; Image: 0152. Massachusetts Vital Records, 1841-1910, , Vol: 465 ; Page: 531. Massachusetts: Grand Lodge of Masons Membership Cards, 1733-1990., , Vol: Hol-Hyz Surnames. p. 4403. Chelsea (Massachusetts). City Clerk, Death records, 1850-1899, Salt Lake City: Genealogical Society of Utah, (1966) Microfilm #482904 of the Family History Library, Salt Lake City, Utah.